This is not a normal soap opera question. Traditionally, the standard soap opera question used to be: “Can this girl from a little mining town in the West find happiness as the wife of a wealthy and titled Englishman?” But times have changed. These days, soap opera questions are approximately sixty percent DNA-test-related, twenty percent little mining town, and twenty percent miscellaneous. 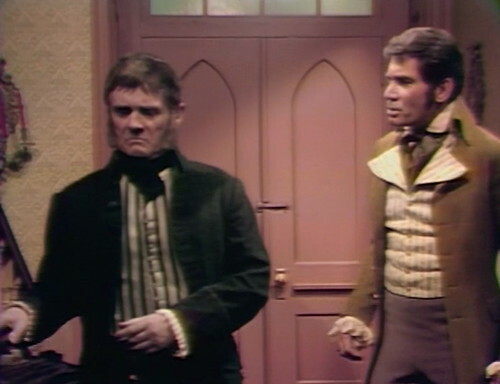 But Dark Shadows was the true innovator in the field, the only show that dared to ask the question: What happens if you go back in time and find that someone is killing the vampire that you happen to be friends with, before he has a chance to become a vampire? And Vicki is really struggling with that question right now. Last week, she was mysteriously transported through time with very little advance notice, and she’s already managed to land a decent job and make some significant headway on acquiring a period-appropriate wardrobe. So if she can keep a lid on saying “sorry, I thought you were someone I used to know in the future” every time she meets someone new, she might actually graduate from 1960s soap opera heroine IQ to the next level up, which I guess would be 1970s soap opera heroine IQ. Naturally, soap opera doctors of the 1790s are just as useless as the soap opera doctors of today. This one starts out by saying, “Mr. Collins, I don’t know what to tell you,” which he might as well have printed on his business card, because they never say anything else. Dr. Thornton: There’s nothing wrong with him that I can detect. Jeremiah: But of course there is! He’s up there suffocating! Dr. Thornton: I meant there is nothing physically wrong with him. Dr. Thornton: I have just given him a complete physical examination. He’s as sound as any man can be. Jeremiah: Then why is he choking? Dr. Thornton: I do not understand any more than you do. Yeah, you can say that again. Apparently the 1790s standards for man-soundness didn’t include the ability to breathe. Thanks for stopping by, doc. And then Vicki goes into her soothsayer routine again. Vicki: Mr. Collins, no matter what that doctor may have said to you, your nephew is going to recover. I know it. Jeremiah: How do you know? Vicki: Because it didn’t… That is, it just can’t happen that way. Jeremiah: What are you talking about? Yeah, good question. Sweetheart, what are we trying to do right now? But it’s heartbreaking; she’s really just trying to help. She doesn’t see these people as a history lesson that she learned from a book. She sees a family in pain, and she wants to reassure them. Unfortunately, the history that she knows isn’t the real story at all. Vicki: The way that you were treating Mr. Collins when he was here… The way that you held him, and tried to ease his pain. You showed such affection for him. Jeremiah: And that surprised you? Vicki: Because I’d always been led to believe that you and Mr. Collins were never very close. What she’s talking about is the amazingly bold series of retcons that they’re perpetrating with this 1795 flashback. They’ve never gone into a ton of detail about the Barnabas / Josette / Jeremiah backstory, but almost everything that they said is being contradicted here. By the end of the storyline, they’ll suggest that the true story was carefully redacted from the official family history — but a lot of the details that we know came directly from Barnabas’ mouth, not from a book. 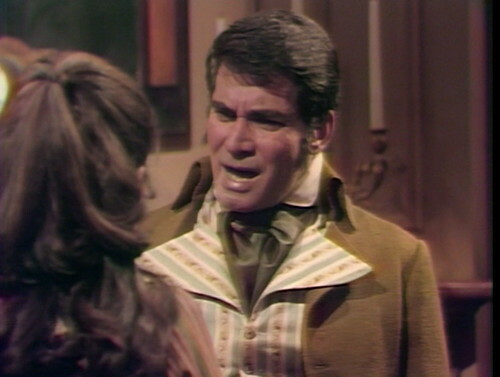 For example: four months ago, Barnabas told Willie that Jeremiah was “the worst enemy I ever had.” Just over a month ago, he brought Julia to Widow’s Hill, and told her that he was first introduced to Josette as “my middle-aged uncle’s new wife”. There’s no way to reconcile both versions of the story, even if you wanted to suggest that Vicki’s time travel is changing the past. 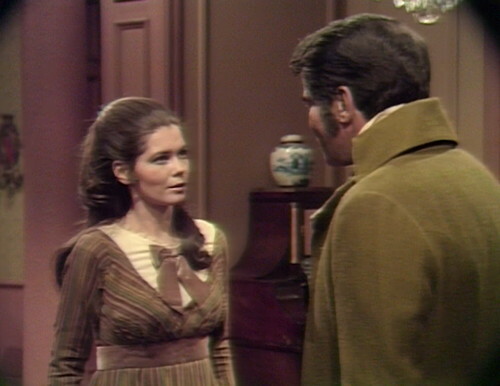 Either Josette came to Collinwood as Barnabas’ fiancee or not, and up until last week, it was very clearly not. But a new writer joined the team a few weeks ago, and they’ve changed their minds, and that’s all there is to it. Happily, they approach this with the appropriate Dark Shadows “damn the torpedoes” style. Jeremiah: For a young lady who’s been in this household exactly two days, and who has no previous knowledge of this family, you have gathered some rather strange, and I might add rude, impressions! Jeremiah: I will not forgive you! But I will inform you — Barnabas and I have always been very close. Although I am his uncle, we are the same ages, and we’ve felt more like brothers toward each other. Now, I don’t know where you’ve conjured up these impressions, but I do not want to hear of it again! Do I make myself clear? It turns out that this is exactly the correct way to do a retcon — unapologetically, and at top volume. Yes, we said something different a month ago, but that was 172 years from now. A lot can happen in 172 years, especially on this show. 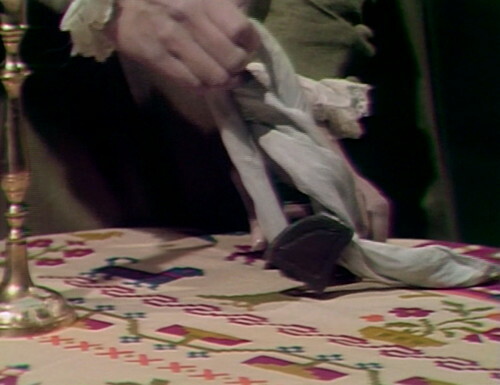 Oh, and in case you were worried: Angelique unties the handkerchief, and now the toy soldier can breathe again. Somebody call the toy doctor and tell him to never mind about the house call. Today’s episode follows directly from Friday’s cliffhanger, but Josette is wearing a different dress. 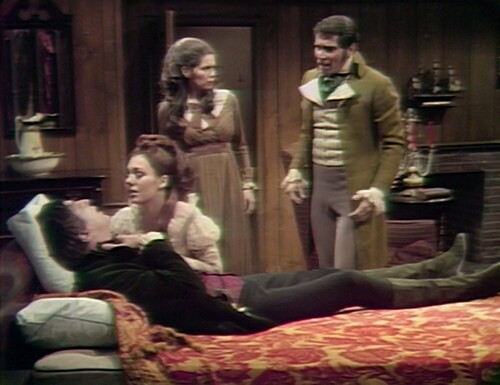 Barnabas collapses on the floor, and Josette rushes to kneel by his side. 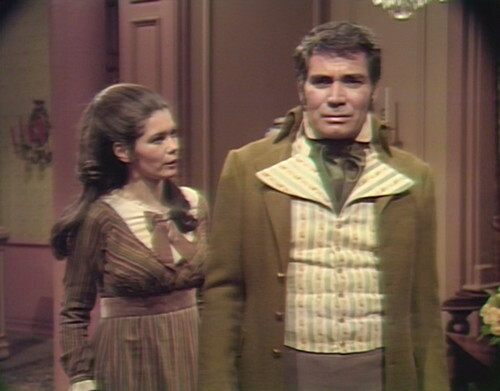 When Barnabas sits up, he’s sitting on the edge of Josette’s dress. A moment later, when Vicki helps Josette get up and move to a chair, she realizes that the dress is stuck under Barnabas. Vicki has to tug on the dress to pull it free. Fill-in actor Peter Murphy pops up again, playing Dr. Thornton in today’s episode. We’ve recently seen him as a stand-in for Burke, Barnabas and Dr. Woodard’s ghost, and he was the recast Caretaker. We’ll see him next in January 1968, filling in for Barnabas lying in his coffin. It occurs to me that whenever Barnabas or Julia went into the past and encountered something strange that conflicted with what they knew of the present, they would step aside and have a brief monologue — sometimes internal, sometimes out loud but it felt like they were sharing their situation with us, the viewer. Vicki never does that and it’s as if she has no relationship with us. She’s the clueless island unto herself. And she’s still a very passive character. She’s also yet to figure out that Angelique is the one person she’s met who doesn’t resemble anyone from the present. Regarding time travel, there’s been enough contradictions all ready for her to not assume that Barnabas is going to survive his sudden illness. And she doesn’t consider her own presence could alter the past. Perhaps she’s aware of how passive a character she is. Vicki also isn’t that amazed at the fact that Jeremiah is a ‘dead’ ringer for her fiancee who supposedly perished in a plane crash. Does Vicki ever do thinks? I wonder if that’s a superpower that only some characters have. The 1795 storyline boldly suggests history is written by the rich, those in power. As you say, Joshua, practically the last Collins standing, redacts everything about these catastrophic months. And that history he leaves ends up warping the family’s view of itself. Pretty daring stuff for an afternoon soap. i keep waiting for vicki to smarten up.should i stop doing that? …actually josette is pretty much an idiot too (so far). maybe barnabus should’ve stuck it out with the crazy girl. I assumed the discrepancies between what Vicki knows and what happens in this story line was a combination of revisionist history and Barnabus’s faulty memory, with a little bit of the writers not paying attention. I thought Jeremiah got a bit too overbearing and defensive with Vicki, especially after she said “Forgive me”. Whatsupwi’dat?? Did she totally besmirch the Collins family name …or did someone just poop in his oatmeal that morning?